Construção-Mercado devoted the column “Technical Solutions” to explore the surface stabilisation system based on the use of steel mesh, steel anchors and cables. A reference source for specialized information used to meet the needs of professionals and companies in the construction industry, the PINI company publishes the magazine Construção-Mercado, focused on the development and construction business. In Issue 178, the magazine devoted the column “Technical Solutions” to exploring the surface stabilisation system based on the use of steel mesh, steel anchors and cables. The system is one of the optimum solutions that can be adopted to ensure consolidation of the slope face of the slope and the containment of 1.5m³ to 1 m³ rock detachment. 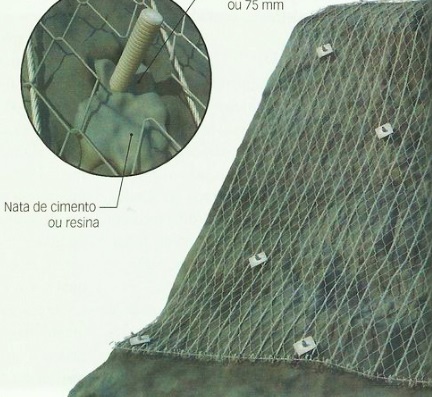 The Maccaferri engineer and technical manager for these systems in Latin America, Matheus Garcia was interviewed by the magazine to explain the technical aspects of the solution. “The system is composed of a galvanized steel mesh with hexagonal-shaped openings, woven together with steel cables, in combination with the anchor plates and bolts”, Garcia said. The NBR 11682:2009 standard, according to Garcia, covers design conditions for slope stabilisation works. However, there is no legislation on the use of coating. “Maccaferri follows the European standards parameters such as UNI 11211, which deals with the execution of a system, and UNI 11437, related to the testing of adopted meshes”, he said. He stressed the importance of maintenance of the coating, reminding engineers of the need for broad surveys of clamps, nuts, plates and the screen to identify points of corrosion. The implementation of a surface protection system must only be made after an analysis of the stability of the slope by a geologist. According to Garcia, the system design must take into account the stiffness of the mesh protection system and the loads that will be transmitted to the anchorages. Such care can optimize investments, apart from reducing the risk of damage to infrastructure works and communities.